It’s frightening to read the statistics about domestic violence in Australia – anywhere from one-quarter to one-third, and even up to one-half (depending on the survey) of Australian women will experience physical or sexual violence by a man at some point in their lives. And tragically, one woman is killed every week in this country by a current or former partner. 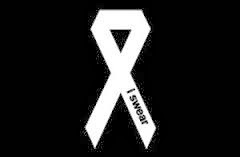 White Ribbon is male-led movement that encourages men to make a commitment against violence, promote positive attitudes and behaviours towards women amongst their peers and to intervene safely to prevent violence again women when needed. In fact the awareness campaign was started following a massacre of 14 women at a university in Canada more than 20 years ago. As such the United Nations General Assembly declared 25 November as the International Day for the Elimination of Violence Against Women, the White Ribbon is the iconic symbol of this day and is a timely reminder for both men and women to encourage positive behaviour and make a stand against violence towards women. This is particularly relevant for communities in regional and remote Australia as it is these areas where instances of domestic violence are highest. Violence has a profound and damaging impact on its victims and on the community as a whole. When women are assaulted by men, or constantly threatened and abused, this leaves deep physical and psychological scars for not just them but their children, friends and extended family. This violence against women is not just a women’s issue. In fact it’s a social issue where men can play a key role in the solution. Not every man is responsible for violent behaviour, but we can all do something to reinforce the fact that violence against women (or violence against anyone for that matter) is not acceptable. So, what can we all do? The simplest thing you can do is to wear a white ribbon or wristband today. This shows others that you do not excuse violence against women or turn a blind eye and that you’re committed to supporting local and global action to stop the violence for good. I’d also like to take this opportunity to highlight the work some of our researchers, like Heather Nancarrow, are doing in this field through the Queensland Centre for Domestic & Family Violence Research. This Centre, located at our Mackay campus, contributes to the prevention of domestic and family violence by informing, promoting and supporting the actions of individuals, communities, services and governments through leadership in research, professional development, education and community engagement. I’m also so pleased that as part of our last Enterprise Bargaining Agreement we now offer staff affected by domestic violence the opportunity to access domestic violence leave and employee assistance. This is just one way we as an organisation are making a stand against domestic violence and ensuring victims feel that they can access help when needed. Let’s let today be a reminder that we all need to take a stand against violence. What will you do to raise awareness and promote positive attitudes and behaviour? Do you know that almost half of the population will experience a mental health disorder at some point in their life? That’s right, mental health issues are common, but there is still an immense social stigma attached to mental health disorders. This is most likely why many people prefer not to seek help despite recognising the symptoms. What’s more mental health will affect most of us on different levels from time to time and I’m sure there isn’t one person who from time to time hasn’t needed time off work for ‘mental health day’. So why is there still such a social stigma? Why is talking about mental health still so taboo in this day and age? Why is it more socially acceptable to get the flue then it is to be suffering from depression? As life gets busier, mental health issues are going to become more prevalent so it’s everyone’s responsibility start recognising the signs and looking at mental illness without the stigmas. Someone suffering from a mental illness shouldn’t have to hide it, if they choose they should be able to openly discuss it in the same way they would a cold or a sports injury. Initiatives like Mental Health Week and RU OK? Day have done much in recent years to start addressing taboos around mental health and have quite likely save many lives because people have realised that mental health is something they can talk about and get with. As depression is predicted to be one of the world largest health problems by 2020, I think we should all continue to check on our loved ones, friends and colleagues (and even complete strangers) from time to time, not just on highlighted days. Importantly we should also take stock of our own mental health and act on it. CQUniversity is a world leader in mental health nursing research and I am very proud of the innovative work Professor Brenda Happell and her team do in this area. This important research is not just helping students learn about the complex area of mental health nursing but is helping individuals and communities in achieving better mental health outcomes. Through the work of this team, students at CQUni have the opportunity to collaborate closely with teachers who have a lived experience of mental illness in order to deeply understand consumer perspectives on mental illness and recovery and to de-stigmatise mental health issues. This method helps students to understand that people suffering from mental illness aren’t just patients but people with the same needs, hopes and dreams as everyone else. This helps our students understand that mental health sufferers are not just patients, but are real people with hopes, dreams and desires that go well beyond their mental illness. This approach is leading the way in Australia and overseas by involving the mental health ‘consumer’ in their own recovery, delivering empowerment to both the caregiver and receiver.